As the rest of Michigan football’s freshman class begins academic orientation on Saturday, they’ll consider their football futures. Some will also consider playing other sports. U-M coach Jim Harbaugh said today he’s glad to let them play multiple sports, if they’re good enough. The topic arose because of U-M linebacker Jordan Anthony, who would like to play football in the fall and baseball in the winter and spring. 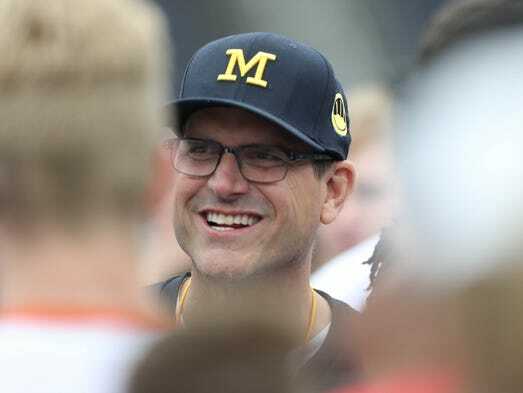 Harbaugh noted that incoming receiver Oliver Martin has that freedom to join the Michigan swimming team and another unnamed player may choose to wrestle. But it’s only if they’re proven with high-level talent in other sports. Familiar face: Harbaugh confirmed that his former NFL running back Alfonso Smith has joined the U-M program as an intern, learning to be a coach. Smith was a running back for Harbaugh with the San Francisco 49ers in the 2014 season. Smith will assist with the running backs but all of his duties must take place off the field.